Marko Cepenkov, worked as a collector of folk art, continued and enlarged the Miladinovci brothers activity. With their capital work "The Collection", they showed to the world the talent of the Macedonian people for creating verses. The folk materials collected by Cepenkov witness about narrative abilities and the wisdom of the Macedonian nation. Marko Cepenkov was self-educated craftsman - tailor who passionately inscribed the folk stories. Marko Cepenkov published most of the collected material in "Zbornik na Narodni Umotvorenija - The Collection of Folks Songs, Riddles and Costumes" in Sophia. In 1954, The "Tales and stories" were published, composed of some of the collected materials. 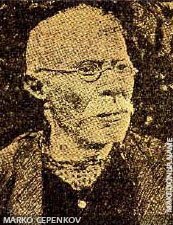 Cyril Penushliski in 1958-1960 published all the materials which were not published at that time, in three volumes entitled "Macedonian folk stories". The institute of folklore in Skopje published Marko Cepenkov's "Collected Works" in then volumes.